Special Offer Every Monday, Red Fort & Lotus Temple at New Delhi is closed for public viewing. Every Friday, Taj Mahal at Agra is closed for public viewing. Akshar Dham Temple New Delhi IndiaDelhi, The political capital of India, Delhi , makes up one of the cornerstones of the golden triangle in the country's north. Finding its genesis in the great Indian epic the Mahabharata, as Indraprastha, Capital of the Pandava princes, today the city has transformed itself into a new incarnation. Reflecting the many colors and flavors of India's eclectic composition, contemporary Delhi is one where you will be inspired, amazed, fascinated and impressed at every corner. The India Gate, Red Fort, Jam Masjid, Chandni Chowk, Kutub Minar, Jantar-Mantar, Laxmi Narayan Temple, Akshardham Temple, Bahai Temple and many more are worth seeing in Delhi. The city is the perfect mix of the old and the new. From the colonial pillars of Connaught Place to the lanes of Chandni Chowk and the malls of South Extension, you will find discover a whole range of experiences here. Delhi is also a paradise for shopping, eating and sight-seeing. Taj Mahal Agra Uttar Pradesh IndiaAgra is a medieval city on the banks of Yamuna River was founded by Sultan Sikandar Lodi in 1956. It achieved fame as the capital of the Mughal emperors from 1526 to 1658 and remains a major tourist destination because of its many splendid Mughal-era buildings, most notably the Thj Mahal, Agra Fort and Fatehpur Sikri, all three of which are UNESCO World Heritage Sites. 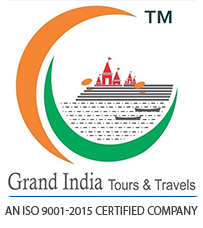 Choose our well compiled and customized golden triangle tours and Experience the DIFFERENCE. Combine it with any one of the below extensions and DISCOVER some of the many faces of INCREDIBLE INDIA!! !Every Monday, Red Fort & Lotus Temple at New Delhi is closed for public viewing. Package Valid FromAny meals other than those mentioned above. Entrance fees to Monuments & sight-seeing points. Welcome to New Delhi, the capital city of India which is famous for its historical, cultural, religious and heritage sites Later proceed for Old Delhi sightseeing which includes Red Fort (world heritage site), Jama Masjid (the largest mosque in India), Chandni Chowk and Rajghat (the final resting place of Mahatma Gandhi). Later proceed to hotel. Reach and check-in at the hotel. Overnight stay in the hotel. Enjoy breakfast at the hotel. 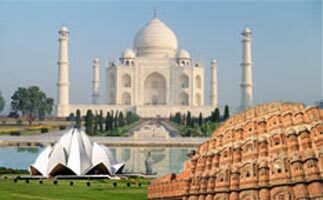 Check-out at the hotel and proceed to Agra, the land of Taj Mahal. Enroute visit Mathura, the birth place of Lord Krishna. Later visit Sikandra to see famous Akbar’s Tomb. Upon arrival at Agra, proceed to the hotel. Reach & check-in at the hotel. Overnight stay in the hotel. Enjoy breakfast at the hotel. 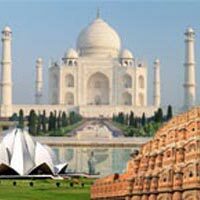 Later visit Taj Mahal the seventh wonder of the world, Agra Fort (world heritage site) and local bazaars for shopping. Overnight stay in the hotel. Enjoy breakfast at the hotel. Check-out at the hotel and proceed to Jaipur - capital city of Rajasthan. Enroute halt at Fatehpur Sikri – world heritage site. Fatehpur Sikri is famous for its ancient monuments such as Buland Darwaza (the largest gate in the world), Panch Mahal, Jodha Bai Palace, Birbal Mahal and Salim Chishti Dargah. Later drive to Jaipur and check-in at the hotel. Overnight stay in the hotel. Enjoy breakfast at the hotel. Later proceed for Amber Fort which is a magnificent fortress constructed on the top of a hill in the outskirt of the city. En route halt at the palatial Jal Mahal Palace. Later proceed to Jaipur city tour which is also known as the Pink City of India. Major attractions to visit includes City Palace Complex, Hawa Mahal (the Palace of Winds), Jantar Mantar Observatory (world heritage site), Birla Temple and Albert Hall Museum. Explore local bazaars in the evening for shopping. Overnight stay in the hotel. Enjoy breakfast at the hotel. Check-out at the hotel and proceed to Delhi. Upon arrival at Delhi, proceed to the hotel. Reach & check-in at the hotel. Later proceed for New Delhi sightseeing which includes Qutub Minar (the longest brick minaret in the world and world heritage site), Lotus Temple (Bahai place of worship), India Gate (all India war memorial), Parliament House & President House. Overnight stay in the hotel. After breakfast proceed back to Delhi for your onward journey with sweet memories of Incredible India. We await for your next visit. Bon Voyage. Service ends.